Did you know, that as a non profit organization, you can use SMS marketing to strengthen your fundraising efforts? On the surface, you might hear the words “SMS marketing”, and assume that this strategy is exclusively reserved for small business owners, but this is the furthest thing from the truth. We work with hundreds of large non profit organizations nationwide, and help them grow their level of influence with these simple SMS marketing campaign ideas. Request donations from local supporters/long time donors. Fire out an SMS campaign that includes a “click to donate” link. Redirect subscribers to the proper collections channel, and watch as your efforts are multiplied. Fire out event reminders; leave no loyal team member behind. 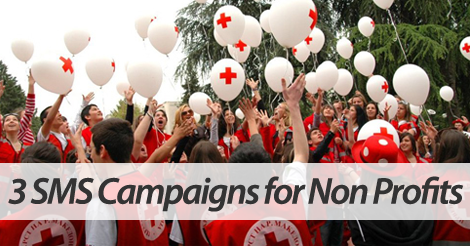 Keep people in the loop about fundraisers, drives, charity balls, and more. With one simple text message, you can turn even the simplest event into a wild success. Drum up support via cause related campaigns. Trying to build awareness around drug related criminal activity? Or maybe you’re trying to educate local teens about the dangers of narcotic abuse. Either way, use text messaging to rally up the troops and drum up support for your cause related campaign. Considering 99% of all text messages are opened within five minutes or less, the odds are definitely in your favor. Partner up with the top SMS marketing provider for non profits, SlickText.com. Give us a ring at 1.800.688.6290 to learn more, or head over to our pricing page and sign up for your free plan. Simplify your fundraising solutions with easy to use solutions from SlickText.com. So maybe you signed up, but you’re not quite sure where to start. Trust us, that’s totally normal. Shoot us an email at info@slicktext.com with any questions, or head over to our SMS marketing learning center, and comb through our valuable resources.